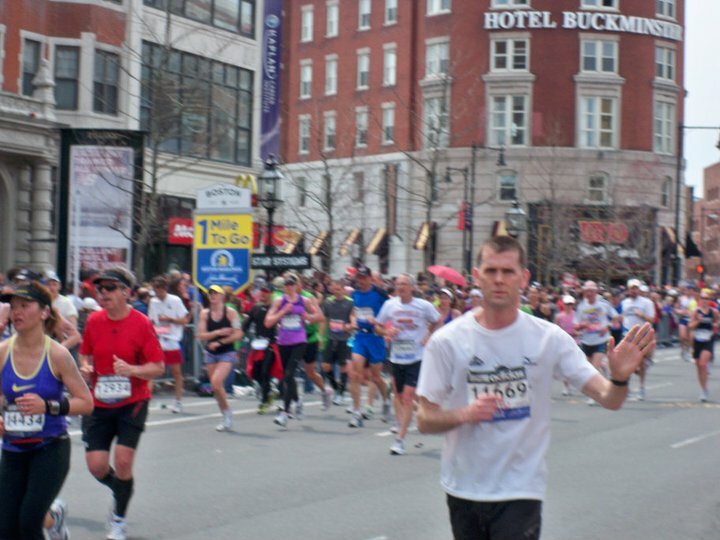 The second wave of runners in the Boston marathon started slowly. The crowd was thick, and only a slow jog was possible as we crossed the start line. There was an ocean of bobbing heads on the road ahead. I wore a synthetic t-shirt, running shorts, sox and shoes. The sun was bright, and as I ran along the right side of the road, I looked for a discarded cap that I might pick up to wear. It had been chilly at the runner's village, with a stiff breeze. On the road the wind was behind us, and the sun felt warm. Mile 1 felt slow, and came in at 7:55. I'd shared a seat on the school bus ride out to Hopkington with an E.R. doctor from Buffalo named Gregg. Like me, he had small children, and we talked about life in the midwest and running. He warned me to stay out of the sun at the athletes village, and recommended going easy on the first downhill miles of the race. It was like this the whole weekend. I kept striking up conversation with cool, interesting people at every turn. It was like being on the Appalachian Trail with thru-hikers. Everyone was engaging in their passion, and as this was shared, there was an ease in chatting with strangers. Where are you from? What are you looking to do today? Mile 2 was 7:30. Many people had discarded gloves and hats along the side of the road. I hadn't found a cap yet. The crowd was still dense, but the corral staging seemed reasonable - we were all running a similar pace. 3 was 7:45. The route passed in front of people's houses, and I slapped hands with children who were watching the race. Mile 4 was 7:51. I was hot already. 5 was 7:47. I carried my usual fuel: small doughnuts and a brownie in a plastic bag. My forehead was sweaty. At a water stop I took water and ate a doughnut. 6,7, and 8 were 7:47, 7:45, and 7:55, respectively. I didn't feel bad, but the running didn't feel effortless either. Had I done too much sight-seeing the day before? My legs felt a little tired. Mile 9 was 8:10, but this included a pee break. 10 was 7:35. I took on more water, and had a bit of my brownie. I was back on pace, and in double digits. 12 was slightly downhill in the approach to Wellesley. I saw a tall guy trip and fall here, though he was up and running again rapidly. In mile 13 I could here the women of Wellesly college screaming their support to the runners. I'd read about the tradition of these women kissing runners, and now I saw that many students had signs indicating why you should kiss them: "Kiss me if you are from NYC"; "Kiss me if you are from Utah". I was content to just slap hands. But then I saw an unusual one: "Kiss me, I'm a neuroscientist". I teach neuroscience. So I stopped and kissed a Wellesly neuroscientist wearing a green sweater. Mile 13 was 7:40. I passed the half-marathon point in Wellesly at 1:42. Now I was starting to tire a bit. My right achilles was tight, and my left quadricep felt sore. 16, with the downhill to route 128, was 7:33. 17, with the first of the Newton hills, was tough. I was starting to suffer. My achilles and left leg were sore, and I was taking water now frequently. This mile came in at 8:19. Mile 18 was 8:28. My pace had slipped, but this was a hilly mile. 21, with Heartbreak Hill, came in at 9:40. Now I was moving into survival mode. My legs felt spent. I started to think about just gettng to the next mile marker. The crowds were frenetic. I'd never run is such an atmosphere before. 22 was 9:31. Now on Beacon Street, I was entering a private world of exhaustion. I took water or Gatorade at every stop, and had to stop myself from downing the entire cup. I'd read somewhere a quote from an ultra-marathoner - Ann Trayson? - who said that it hurts up to a point, and then doesn't get any worse. I kept that in mind, but it seemed to be getting worse. 23 was 10:12. Yesterday I'd walked through Coolidge Corner, and now all I could do was shuffle through. Mile 24 was 10:50. Many people were passing me. I had nothing left in my legs. If it had been an emergency, I probably could have sprinted another 100 meters, but that was all that was left. I switched to run-walk. I'd run for a minute, then walk for 30 seconds. Now, my goal was to get to the finish line with the little bit of energy I had left. This worked well for a bit. The walk breaks strengthend my run periods, and I'd catch the same people who'd run past me on the walk segments. The small rise in the road over the highway caused my left calf suddenly felt like it had been put in a vice. I couldn't run. People shouted at me to keep going, but I could only hobble. Mile 25 took me 14:38. My mother and sister were waiting for me at Kenmore Square. I started running again, and my sister snapped a photo. 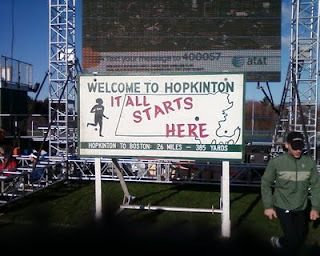 I started running as the route headed towards Boylston Streeet. I was near a guy dressed as a cave-man, running barefoot. I saw the finish line and tried to run hard, but cramped again for a bit. This eased, and then I ran across the finish line, with the last 1.2 mile segment taking me 11:44. I'd started this blog two years ago as a way of documenting my attempts to qualify for and run the Boston marathon. I tried to qualify at the Edinburgh marathon, but failed. Later that same year, I was able to run a qualifying time at the Loch Ness marathon. To finish this blog, I was hoping to describe was how, at Boston, I'd picked up the miles and layed them down. But the race didn't go that way. Still, I was there, and it was terrific.